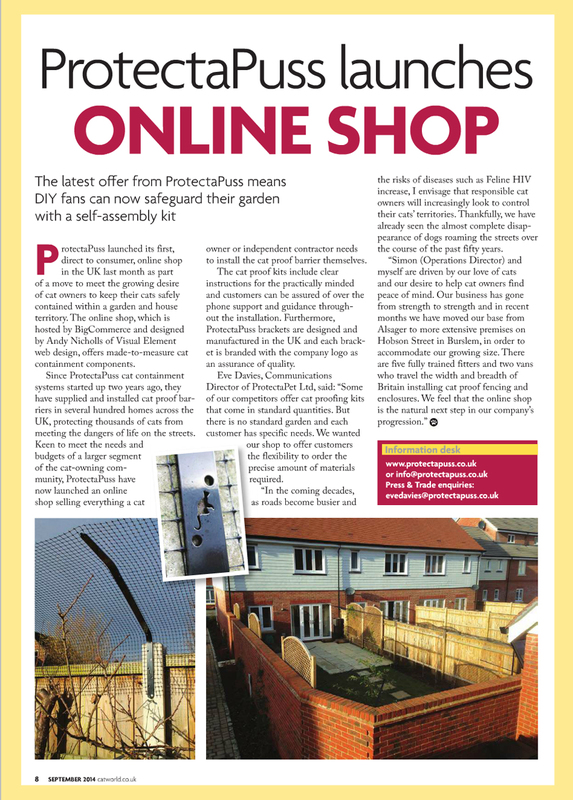 ProtectaPuss launched its first direct to consumer online shop in the UK this week, as part of a move to meet the growing desire of cat owners to keep their cats safely contained within a garden and house territory. The online shop, which is hosted by BigCommerce and designed by Andy Nicholls of Visual Element web design, offers made to measure cat containment components. Since ProtectaPuss cat containment systems started up two years ago, they have supplied and installed cat proof barriers in several hundred homes across the UK, protecting thousands of cats from meeting the dangers of life on the streets. Keen to meet the needs and budgets of a larger segment of the cat-owning community, ProtectaPuss have now launched an online shop selling everything a cat owner or independent contractor needs to install the cat proof barrier themselves. The cat proof kits include clear instructions for the practically minded and customers can be assured of over the phone support and guidance throughout the installation. Furthermore, ProtectaPuss brackets are designed and manufactured in the UK and each bracket is branded with the company logo as an assurance of quality. ‘Simon (Operations Director) and myself are driven by our love of cats and our desire to help cat owners find peace of mind. Our business has gone from strength to strength and in recent months we have moved our base from Alsager to more extensive premises on Hobson Street in Burslem, in order to accommodate our growing size. There are five fully trained fitters and two vans who travel the width and breadth of Britain installing cat proof fencing and enclosures. We feel that the online shop is the natural next step in our company’s progression’.